The MetroClick single and double sided outdoor kiosk units can also help enhance any outdoor space. Fully weatherproof with integrated heating and cooling systems, we manufacture kiosks that are built to withstand all types of environments and even the harshest weather extremes. Additionally, our devices are built in stainless steel encasements with Gorilla Glass screens to negate any concerns about vandalism or theft. We’ve got you covered rain, the sun, snow or rowdy patrons for corporate events, shows, and real estate. Nowadays, an outdoor kiosk booth used to provide various services and also serve as a point of sale has become ubiquitous. These are detached, interface based, automated systems which can be used to access information or facilitate business transactions of the sale of a variety of products. They comprise a computer and a touch screen monitor and are unlike usual computers because they have a defined function and are proposed to be used by the common public. An outdoor kiosk is most suitable when placed in areas frequented by people and facilitates the entry of information by customers by way of an input set-up like touch screen and keyboards. 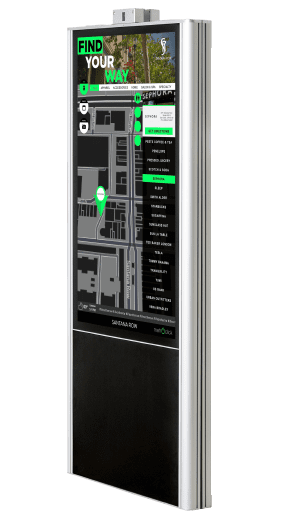 A kiosk placed outdoor is usually enclosed securely and has a variety of components like a communication apparatus, speakers and amplifiers, a keyboard and sensors to offer an idyllic interface experience for all those who use the kiosk. These kiosks are equipped to function independently, without any support from the business’ personnel. These make up the main aspects of any outdoor kiosk. Such kiosks can offer loads of benefits to the public. These kiosks have been designed to meet specific expectations from the public. They offer them practical help by cutting down on unnecessary waiting periods common in many government bureaus. The public need not be computer literate to make use of kiosks as they don’t call for any particular preparation for being utilized. An outdoor kiosk can be gainfully situated at locales with a low computer usage to help people with no internet access avail different services. An outdoor kiosk is extremely proficient and can comprehend virtually any instruction right away. These kiosks can give the public an improved experience and free them from the exasperation of being incapable of conveying their requests. People can carry out the particular tasks they want to. They don’t need to come back again on account of long waiting periods or decreased staff numbers. Such kiosks are easy to contract as rentals or to purchase directly. They can help reduce financial constraints by reducing the requirement for extra staff. They can make use of resources more efficiently. Kiosks can be used as an instrument for improving outside service and engender a well-organized internal system. An outdoor kiosk can ensure an increase in the rate of return. This means that by reducing the spending on additional staff and increasing the profits at the same time can be possible by using outdoor kiosks. When deploying outdoor digital signage kiosks, it is essential in the planning stage to consider all the issues that influence the deployment of a failed project. One issue is that buyers must select a kiosk with an adequate display screen. The display is the kiosks primary user interface and the first thing a customer notices. The screen experience can mean the difference between a good or bad self-service experience. Outdoor kiosks demand that the displays are highly robust, readable and rugged. Displays that are designed for indoor use do not perform well outdoors, for the best solution you must use a special touch screen that tolerates frequently changing weather conditions. Customers must be able to read the display in direct sunlight. To guarantee the best customer experience, a flat panel display must be brighter than the normal 200-240 Nits, ideally in the region of 500-1000 Nits. Also look for a display that has an auto dim option as this lowers the brightness at night and on cloudy days. When using a touch screen ensure it is sealed against rain and moisture and check to see if it has safety glass fitted that protects against vandalism and harsh use. Solid state disc or hard drive computers have both advantages and disadvantages, such as: What are the application requirements? How mill user experience is affected? If the temperature is an issue make sure all the electronic components have acceptable temperature ranges. When decided on an outdoor kiosk, one factor must be the material the kiosk is made from, it has to be made from steel and then powder coated, as other materials just cannot survive outdoors will most likely crack in extreme weather. If an input device is fitted to the kiosk, such as a mouse or keyboard it must be up to the job of being wash down and will hold up in severe weather. The electronic components that are in the kiosk need to be mounted on anti-vibration mounts to minimize any damage when subjected to severe vibration. Outdoor LCD Enclosure Or Outdoor Kiosk Outdoor LCD enclosures or outdoor kiosks will make you outdoor digital signage campaign a success, the choice is yours so you can decide which is best? Before you invest any of your dollars in a digital signage system, you will want assurances that the system will generate a positive Return On Investment otherwise, it is not worth the time. Now an outdoor LCD enclosure is designed specifically for protecting flat panel displays such as plasma or LCD panels in hostile outdoor areas, these are normally non touch, so the consumer experience is limited to the compelling content that is delivered to the display. The viewing window can be supplied with an anti-glare window and can be fitted with a touch screen film if needed. These do provide a cost-effective solution and puts outdoor digital signage in the reach of almost every business owner in the world. Cost is a huge aspect when selecting a digital signage solution, but an outdoor kiosk can be used as a self-service kiosk these can increase customer satisfaction whilst engaging customers and are used to cross-sell and up-sell. We all know a happy customer is a customer who spends more money. A kiosk normally comprises of a touch screen LCD that is mounted into the “head” of the kiosk, the computer is then mounted in the “body” of the kiosk along with the data and power connections. These normally cost more to manufacture as there are more high-end components. MetroClick can design an outdoor kiosk system that serves your organization’s needs. Contact us today.